PIN IT NOW TO SAVE! What is a quiche? It’s basically a custard made of eggs and cream baked inside a pie crust. 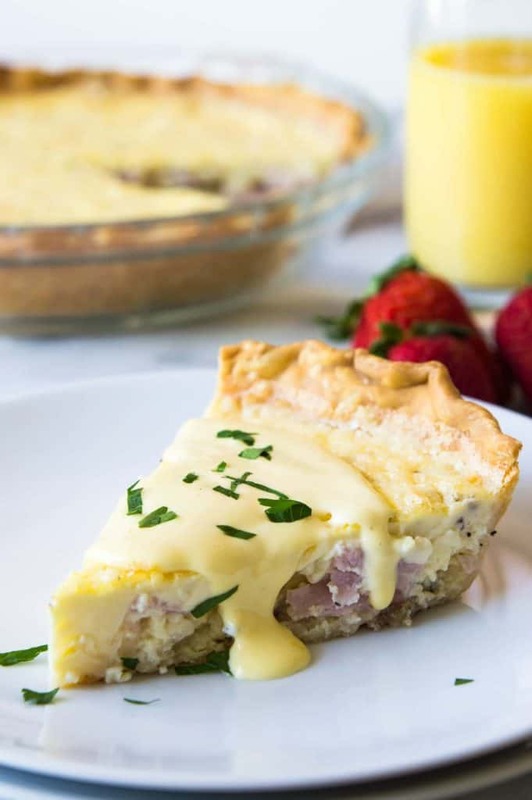 This quiche is loaded up with Canadian bacon, creamy custard egg filling, and is topped with an easy to make homemade hollandaise sauce. The perfect brunch recipe. Easy to make. And tastes like an Eggs Benedict! I happen to love brunch. The hubs and I used to go out for brunch at this wonderful little restaurant in Dallas, that would serve endless mimosas, fabulous Fettucini Alfredo, and the BEST eggs benedict I have ever had the pleasure of enjoying. The entire experience was always so fun. The place was always crowded, people walking the trail nearby stopping with their dogs, people hanging outside waiting for hours to get their tables while still being able to enjoy the endless mimosas. The wonderful feeling of having nowhere else to be, nothing else to do, other than to hang out and wait for a table in the little restaurant. Not to mention the delight of the bubbly mimosas. This recipe is an attempt to recreate that magic at home. I do have to take a moment to tell you the most important tips about this quiche. The ratio of the cream and milk to the eggs is definitely IMPORTANT. Pay attention! I learned this from Julia Child, and let’s just say, this lady knew a thing or two in the kitchen. You want your egg and cream combined to equal 1/2 a cup per egg. Which is why if you watch the video you see me making the egg mixture in the measuring cup. That’s so when I add my 5 eggs I know that the total mixture needs to be 2 and 1/2 cup. The best way to mix the eggs for a quiche is to use a hand mixer. This ensures that the eggs are mixed completely and ensures a smooth and creamy custard. 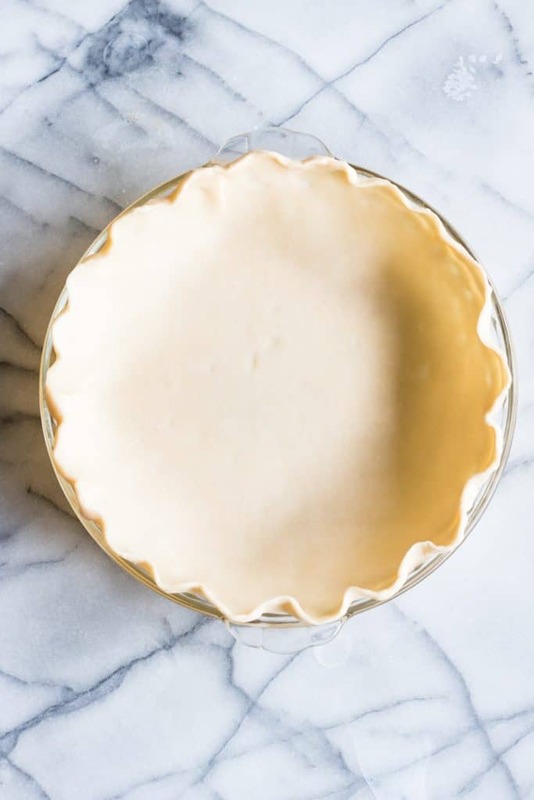 Is it necessary to blind bake the pie crust? YES! It keeps the crust flakey and not soggy. 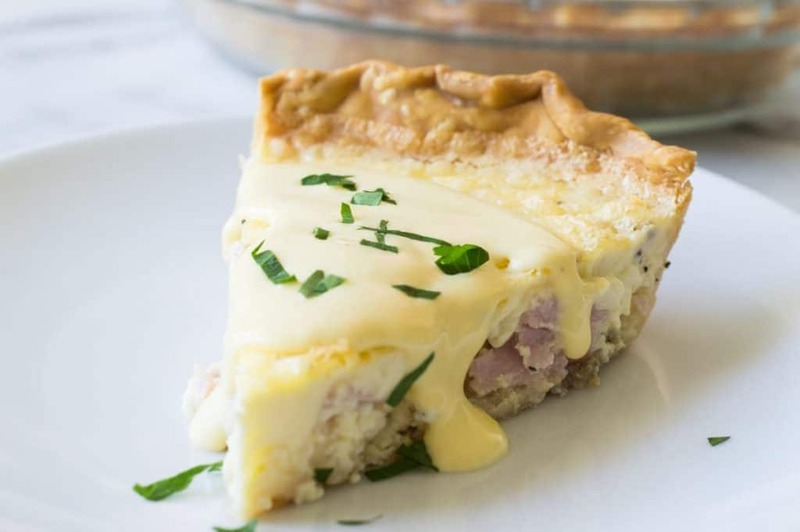 It’s best not to poke holes in the pie crust when making quiche because the holes can remain and will allow the egg mixture to leak out of the crust while baking and will make the pie crust stick to the dish. 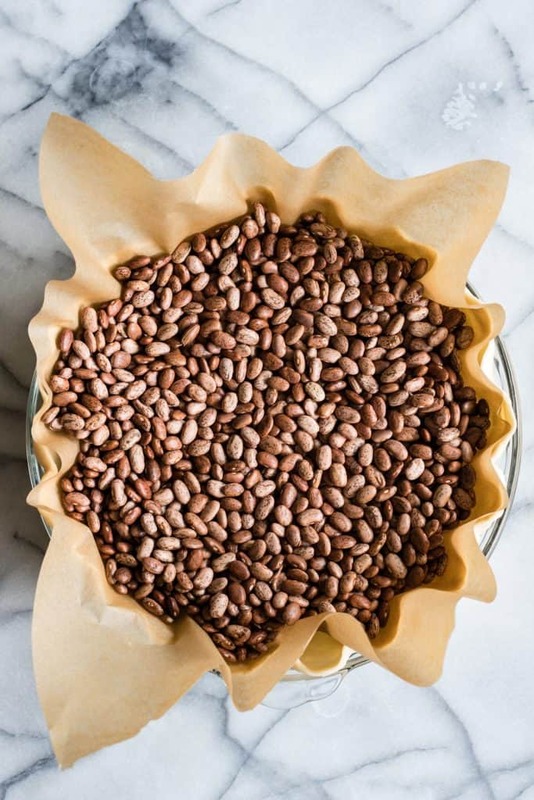 I use pinto beans inside the pie crust to blind bake, or you can use pie weights. I have more information on this in my detailed HOW TO MAKE QUICHE post. Plus check out my HOW TO MAKE QUICHE post for tons of other tips and tricks when it comes to quiche. 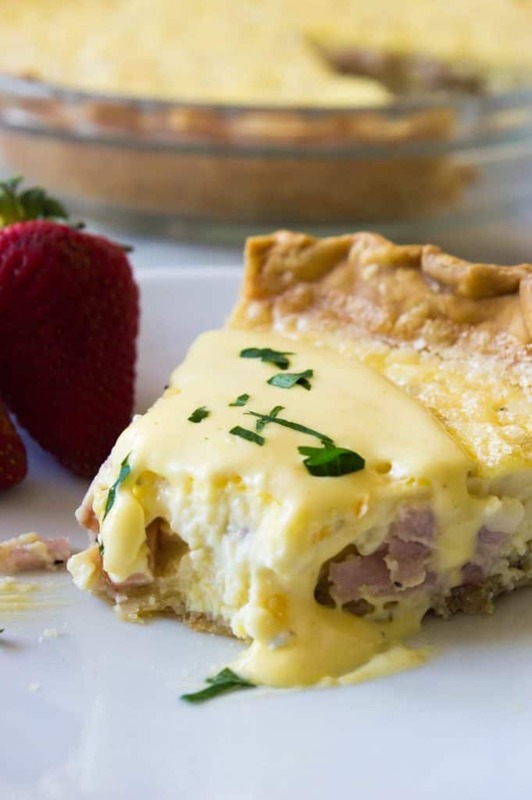 WANT TO TRY THIS EGGS BENEDICT QUICHE?! PIN IT to your BREAKFAST, or BRUNCH Board to SAVE FOR LATER! Eggs Benedict Quiche! 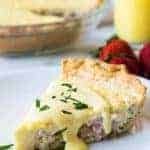 This super easy to make quiche comes out with perfectly flakey crust, creamy egg and bites of canadian bacon. Not to mention it’s smothered in an easy to make blender hollandaise sauce. Perfect for brunch and upcoming Mother’s Day! 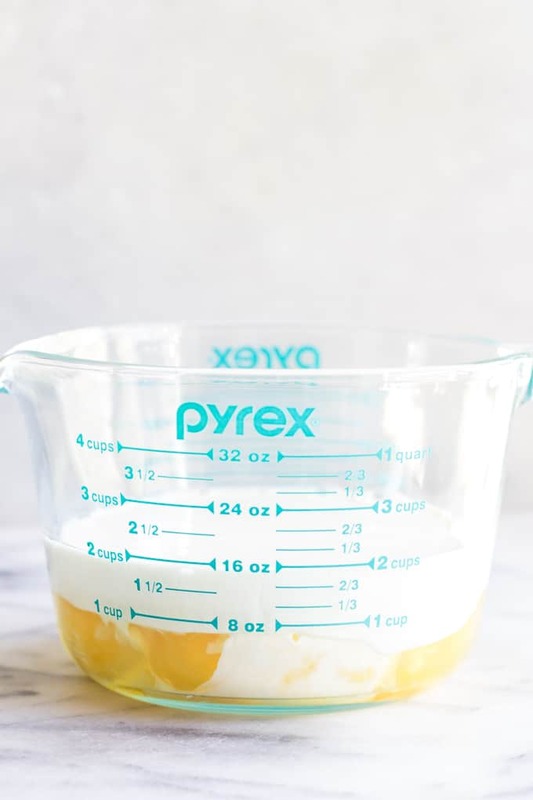 Prepare the egg mixture by adding the eggs to a large measuring cup. Add the heavy cream, then add the milk, the total measurement of the eggs, cream and milk should come to 2 and 1/2 cups. Add the salt and pepper. Mix with a hand mixer to ensure the egg and cream mixture is light and frothy. Spread the diced canadian bacon on the bottom of the pie crust. Pour the egg mixture on top. Bake at 350 degrees for about 45-50 minutes. The quiche will be slightly wobbly in just the center. Add the butter to a small saucepan and heat over low to medium heat. While the butter is melting add the egg yolks, lemon juice, salt and cayenne to blender (I found using the smaller jar for my blender worked better since the blades are able to get the small amounts easier). Once the butter is just melted and starting to foam up remove from heat. 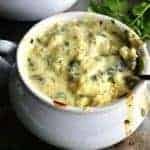 Blend the egg mixture in the blender for about 10-15 seconds then start to drizzle the hot butter into the blender while blending. Be careful! Once the hot butter is all added to the blender continues to blend for an additional 10-15 seconds. You will have a thick sauce. If too thick you can thin out with a small amount of water. You can also adjust seasonings if you prefer more salt or pepper. Use hollandaise sauce immediately. Serve spooned over slices of the quiche. Garnish with parsley if desired. ***Total measurement of eggs, cream, and milk should come to 2 and 1/2 cups. Follow this guideline over the amount that is shown in the ingredients list. For hollandaise, your recipe says to continue to blend for 10 to 15 MINUTES???? This must be a typo. It only takes seconds. Yes! That is a typo! Thanks so much for catching it. It does only take a matter of seconds. benedict eggs are my son favorite breakfast. I made them few times but I never tried this way. Should i cook the bacon first? I love Eggs Benedict and the quiche was excellent!! 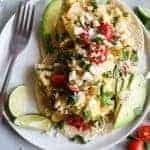 Just wondering tho, if you have Hollandaise sauce left over, or you want to make it ahead of time, how do you reheat it?? ( I know that sounds like a dumb question but……) I tried reheating it and the sauce was very lumpy following. Please advise..thanks!! Hi Nancy! I’m so glad you enjoyed the recipe!! Reheating hollandaise can be extremely tricky as you can end up cooking the eggs to a point of scrambled eggs, which is why the sauce ended up lumpy. I’ve had decent luck at reheating in the microwave by doing it in 5 second increments and whisking, another 5 seconds and whisking, and continuing with that until it’s warm enough. I hope that helps!! Can you use an immersion blender to make the hollandaise sauce? Instead of the blender? This seems easier than the overnight eggs Benedict casserole. Hi Mary! 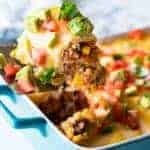 This is definitely an easy dish to make. And I haven’t tried the sauce with an immersion blender..because I just broke down and bought one a couple weeks ago. But I imagine it would be the same, just make sure you have it going while you pour in the heated butter. I’m going to give it a try myself the next time I make this! I use my immersion blender for the Hollandaise all the time. Works great! Just pour a little bit of the butter into the eggs first to temper. As soon as it gets stiff slowly drizzle in the remainder. The hollandaise is not cooked? What about the raw eggs?? Hollandaise is made by emulsion with the butter and the egg. If the egg were cooked through, then you would end up with a scrambled egg mixture. The egg is heated to a safe temperature with the heat of the butter though. If you have any concerns then you can make sure you are using pasteurized eggs, or you can avoid hollandaise. Would like to see the recaps. On pintrist please.thanks.. This recipe is genius, can’t wait to make it. One question, I noticed you did not dock the bottom of the pie crust, should I not dock it before blind baking it? Serene: I have a question, what about cheese? Usually quiche contains cheese but I’m not that familiar with Eggs Benedict enough to know if it would change the authenticity of the flavor you are achieving. Thanks! Love your blog! I’m in Texas too! Hi Meredith! You and my husband would get along famously! He’s constantly asking me where the cheese is. And to be honest, this quiche doesn’t need it. The custard made from the egg and cream is so smooth and creamy on it’s own. You will not notice that there isn’t any cheese. 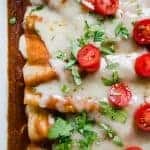 My husband asks me every time I make this, “there’s cheese in this one right?” NOPE! Haha. No cheese needed. You can of course add some in if you like! Amazing, never made one without cheese (swiss) which can be hard to find grated. Need to make quiches this weekend and freeze, to use up some of my girls eggs and couldn’t find the cheese….. which works out fine for me!! This looks fabulous! I like to add spinach to my Eggs Benedict, Do you think that could be added too? Don’t want to add something that is going to give it too much water…. Can’t wait to try this!! Hi Lissa! You can absolutely add spinach to the quiche. You can add in fresh baby spinach, just make sure that you pat it dry with paper towels to blot off any extra moisture before adding it in. Adding spinach would make it a Florentine Eggs Benedict lol Sounds absolutely delicious! Just wondering it says heavy cream what kind of heavy cream and what brand? I always just use regular heavy whipping cream, and it doesn’t matter what brand. I’ve used Lucerne, store brand names, they all turn out the same. Hi, thanks for the recipe – can’t wait to try it! If I am using a pre-made pie crust do I still bake for 20 minutes with parchment and 10 without? Hi Christina! 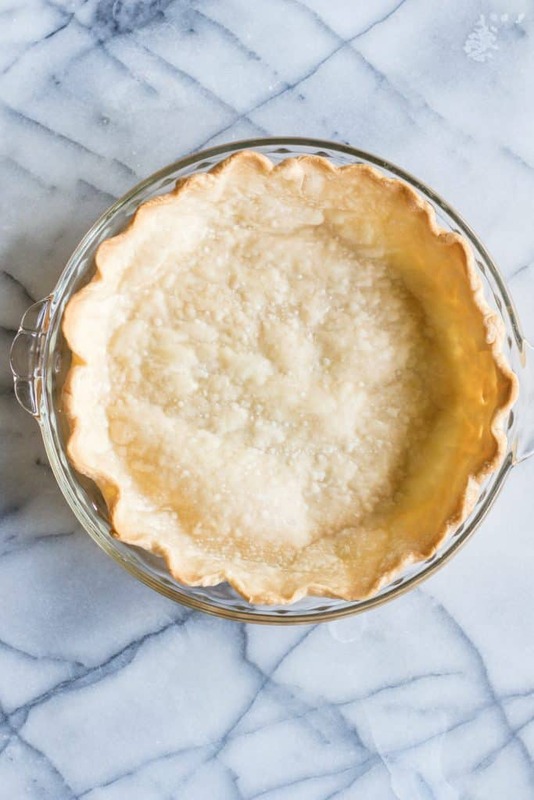 If the pie crust is already baked then no need to pre-bake it. If it’s just a pre-made crust like the ones from Pillsbury, where it’s just the dough, then yes! Still pre-bake it. It keeps the crust nice and flakey. Turned out amazing!! The eggs were creamy. The crust stayed flakey as promised and I was so proud that my hollaindaise turned out too!! Thanks! Could I make this a day a head of time and just reheat it for dinner the next day? If so how long would it take to reheat? This recipe brings up two questions . I’ve always wondered, why use unsalted butter when the recipe calls for salt and can the beans be saved after they’re baked to cook later in chili? Thanks in advance for your reply. We use unsalted butter when baking because every butter, every company that makes butter, uses a different amount of salt. So if I’m giving a recipe using a certain type of salted butter, you may be using a different butter with a different amount of salt. So we have no idea of knowing how much salt is in the butter and how much more salt would be needed in the recipe. So to make it an even playing field, we use unsalted butter when baking and add the amount of salt needed on our own. No guessing needed. And for the beans. No we can’t use them in another recipe. I keep my beans in a jar labeled as Pie Beans. And I use the same beans every time I bake a pie crust. 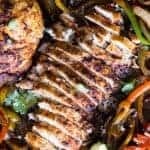 I just made this for dinner and it is AMAZING!!! Will definitely be making this often!!! Best breakfast quiche. Made the day before serving, reheated and it turned out wonderful. I blended the hollidaise sauce in my mini food processor because my blended is so big, worked great and easier clean up. Big hit with my family and guest. I’d like to make this crustless. Is that possible? Absolutely! I have made this crustless also, it turns out great! Hi Denise! Just follow the instructions in the recipe for blind baking the crust. 20 minutes with the pie weights, then another 10 minutes. And I didn’t cook the Canadian bacon first, but you definitely can. Just fry it up in a skillet to add a little crispness if you want. Being allergic to dairy I used coconut cream instead of whipping cream and almond milk. Used smart balance butter for the sauce. Turned out great.